Leftist Palestinian parties on Jan. 25 held demonstrations across the West Bank in opposition to negotiations with Israel and US Secretary of State John Kerry's framework proposal that will serve as the basis for proposed talks. Rallies in Hebron and in Nablus brought hundreds to the street to reject the negotiations proposals from the US leader, which they claimed were intended to "liquidate the question of Palestine and prolong the Israeli occupation." Kerry is expected to announce a framework proposal to guide ongoing negotiations between Israel and the Palestinian Authority within the coming days Some expect the proposal to include demands that Palestinians relinquish control over large areas of the West Bank upon which Israel has built settlements, as well as demands that the Palestinians recognize Israel as a Jewish state. 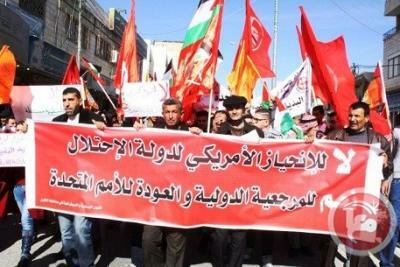 The rally in Hebron kicked off in front of al-Hussein Ibn Ali football stadium in the southern West Bank city. Demonstrators carried Palestinian flags and flags of leftist factions, alongside signs denouncing the "pressure" the US and Israel are putting on the Palestinian people and the Palestinian Authority to accept negotiations. Member of the central committee of the Palestinian People's Party Fahmi Shahin delivered a speech during the rally, calling upon the Palestinian Authority to "immediately stop peace negotiations and to reject the US sponsorship to these talks." The US proposals “to accept the Israeli occupation as a fact must be rejected," he added. Shahin urged the Palestinian Authority to reject any move to recognize Israel as a Jewish state and called upon them to demand the implementation of the Palestinian refugees' right of return to the villages from which they were expelled in 1948. The demonstrators later headed to a protest tent erected by UNRWA employees in the city, in order to show solidarity with local workers currently on strike against the UN refugee agency due to a series of layoffs. In Nablus, hundreds attended a rally starting at the Martyrs' roundabout in the northern West Bank city center. The rally condemned Kerry's proposed framework agreement and the perceived US bias in favor of Israel in ongoing peace talks, as well as any proposal to extended negotiations or impose an agreement upon the Palestinians. Participants stressed that the agreement represents a blow to the Palestinian national consensus, as it comes not from international guidance but under US supervision, and is being brought forward without a halt to Israeli settlement construction on occupied Palestinian land. Member of the political bureau of the Democratic Front for the Liberation of Palestine Ramzi Rabah said that Kerry's repeated visits to the region have served as a way to give Israel more time to continue settlement activities, in the process imposing a new status quo that is destroying the possibility of an independent Palestinian state with its capital in Jerusalem. Rabah added that the framework agreement represents a great danger that has been rejected by the Palestinian people as being inconsistent with their national rights. He charged that the agreement is a cover to allow Israel to speed up the processes of settlement and the Judaization of Jerusalem, in the process restricting the choices available to Palestinians. Rabah demanded that Palestinian leadership declare its outright rejection of the Kerry plan and any extension of the negotiations, calling for an end to the vicious circle of futile negotiations that he said only benefit the Israeli occupation. Rabah also praised the position of the European Union, which has launched a comprehensive boycott of Israeli settlement products and Israeli institutions built in areas occupied by Israel in 1967. Peace talks between Israelis and Palestinians were relaunched in July under the auspices of the US after nearly three years of impasse. Israel's government has announced the construction of thousands of housing units in illegal settlements since peace talks began. Palestinian officials have repeatedly said that recognizing the concept of Israel as a "Jewish state" is unnecessary and threatens the rights of nearly 1.3 million Palestinian citizens of Israel who remained in their homes during the displacement of the majority of the Palestinian population during the 1948 war. The internationally recognized Palestinian territories of which the West Bank and East Jerusalem form a part have been occupied by the Israeli military since 1967. From Ma'an News Agency, Jan. 26.